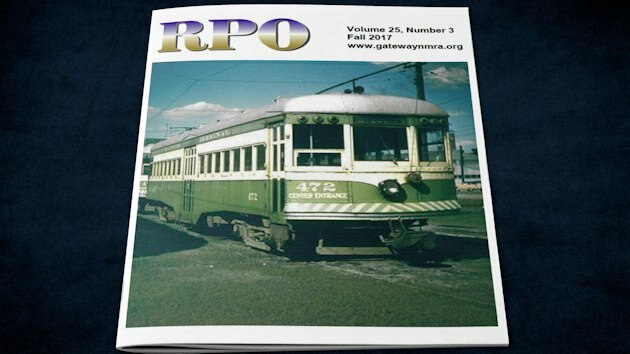 The Fall 2017 quarterly members newsletter of the Gateway Division NMRA, The RPO, is now available online in PDF (Adobe Acrobat) format. The RPO, Vol 25, No 3, Fall 2017 (pdf 1.49MB). This 24-page issue includes the “Superintendent’s Desk” by Jim Ables, “Under the Wire” by John Carty, “Director’s Reflections” by Jon Marx, “Chicago & Illinois Midland Home Shop-Built Sand Car #2002” by David C. Lowell, “Volunteers Needed!”, “Scratch Building Center Entry Cars for the East St. Louis & Suburban Railway” by John Carty, “Division Minutes” by Gregor Moe, “Timetable of Events,” and cover photo provided by the Illinois Traction Historical Society. Edited by John Carty.